Why no Greyhound on Google Transit? – Dude, where's my bus map? Dude, where's my bus map? Why no Greyhound on Google Transit? This one has always been a mystery to me. As you might know from general knowledge, or just from looking at our map, Greyhound Canada is by far the largest intercity bus operator in Ontario and runs something close to a connected network in the province. Yes, obviously it has large gaps, something Shaun and I love to rant about, but unlike almost any other operator, it is possible to plot a cross-province, multi-route trip using their services. As you know, (if you’ve been paying attention!) we created this map and blog in protest at the lack of comprehensive intercity transit maps in Ontario, and Greyhound has been, by far, the worst culprit. As opposed to riders of a small operator, Greyhound passengers will often need plan more complex trips that may involve more than one route and also need to connect with local transit for trips to and from bus terminals. Although Greyhound is yet to produce a map of their own, this sort of journey is perfect for the Google Maps transit tool, as it can save one from opening up several schedules for the local and intercity connections. To see how this works, I plotted a trip from a bus stop near my home (what, you think I’d actually show y’all exactly where I live?) to St. Catharines. I used to make this trip often to see close friends at Brock University. 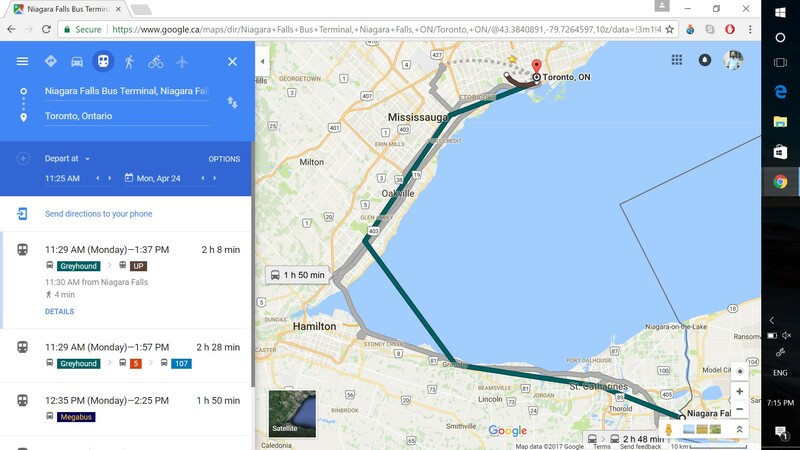 As the screenshot shows, Google advises me to take a local TTC bus to Eglinton GO Train station, then to ride the Lakeshore line west to Burlington; where a connection is made with GO’s route 12 bus to the Niagara Region. The timetable instructions are all listed, along with the route plotted on a map. If I so wished, I could also plot an onward trip using St Catharines Transit, which is also shown on Google Maps. More interestingly, if I look down the screen at the other options Google tells me are available, lo and behold I see Megabus! Even though Megabus is an ostensibly private operator, it is treated through Google Maps as just another public transit option. Personally, I always used GO for this trip, since traveling from East Scarborough to the downtown coach terminal takes a fair amount of time. However, if you did live, say, in the old City of Toronto, you could use Google to make a time comparison between multiple operators and make your own decision as to how you would get to St. Catharines or another destination served by Megabus. Having their schedules on Google is definitely useful to Megabus. Since, until now, there has been no intercity bus map for Ontario (see what I did there?) how else would you know Megabus makes such a trip? Maybe you would have seen an ad somewhere but given that whatever costs that are associated with sharing their route and schedule data with the Google platform must be negligible compared to a number of new riders, it seems like a no-brainer for Megabus to do this. I plotted a trip from that same bus stop to the Ottawa Central Station. That sounds like a train station but in reality, it is the coach terminal. However, using Google, it looks like the only way to travel to the bus station is by VIA Rail. Now, it’s great that VIA is on Google Maps and I often choose to take the train to Ottawa but would it not make sense for Greyhound to make their information readily available on a platform many people use for trip planning? Now that Megabus has done so, it is easy to understand how their services work when compared to GO in Niagara. As a transit rider, I now am armed with more information about potential choices and if a Megabus departure is shown by Google to make the most sense, I’m likely to buy a ticket. That info is nonexistent for the Ottawa trip. Obviously, Greyhound is still used by many in that corridor but what if you wanted to travel to Owen Sound, or Pembroke or…..basically any smaller centre in Ontario. Unlike Ottawa, it’s not a given that Greyhound will serve any of these places and being able to see potential trips and connections on Google Transit could conceivably benefit their business and allow for more people to travel by bus. In order to have information featured on Google, the transit operator needs to make their data available to the tech giant; Google won’t go out of their way to collect the info. This means that for Greyhound, the ball is in their court now that competing bus companies have made their information available. Let’s see what they do with this opportunity. Heya Vince, thanks for having brought more substance to this topic that has bugged me for years. Especially in the until-very-recently era where the private operators did not show up on Google Maps at all. That said, I have more info to put in your plot pipe to thicken it: sometimes Greyhound routes *do* show up on GoogleMaps. Case in point is this itinerary that I made, uncoincidentally choosing a time that I knew meshed well with Greyhound’s schedule. -Why does it show up sometimes, but not others? -Does Greyhound submit its own data, if so, what the heck is it submitting? -If the responsibility for the no-shows is GoogleMaps and not Greyhound, what’s the story with its algorithm? -Will the responsible party (Greyhound, Google, or other) take ownership of this mediocrity? Pingback: The needless odyssey: Taking a bus between Brantford and the Tri-Cities – Dude, where's my bus map?